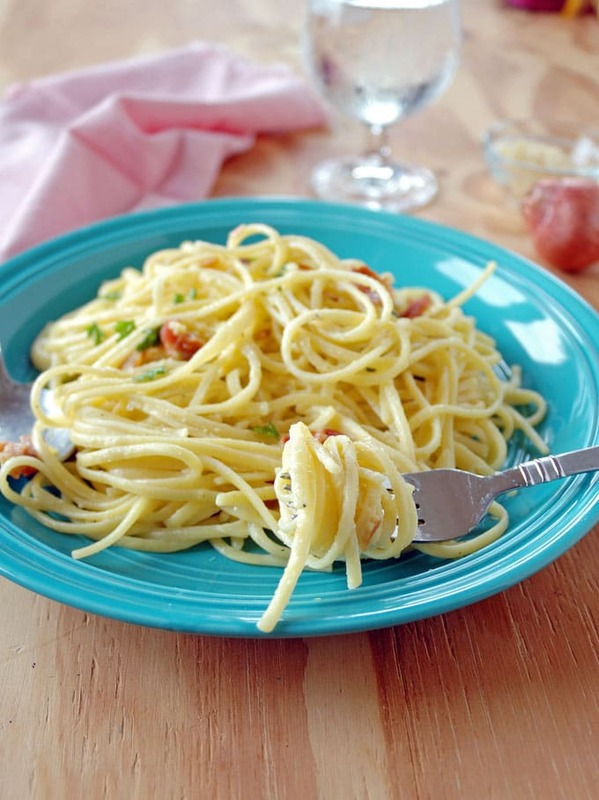 Pasta Carbonara with Shallots can be on your table in under 25 minutes! 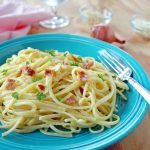 Eggs, bacon, Parmesan, Romano and shallots combine to make a delicious, creamy sauce for linguine, spaghetti or fettuccine. Ahhh, all is right again on my blog, because…pasta! I’ve finally figured out how to make carbonara that isn’t dry nor full of bacon grease. So, I give you pasta carbonara with shallots. It’s delicious! 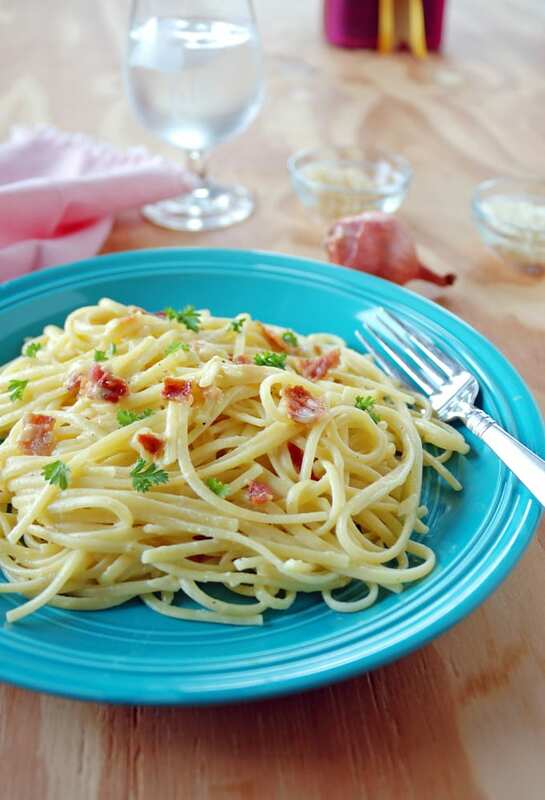 Carbonara usually consists of pasta with eggs, bacon, Parmesan and Romano cheeses, and garlic. The dish traditionally relies on bacon grease and olive oil for fat and flavor. But, I just don’t like the taste nor texture of bacon grease in my food. And, I found that by the time I added enough garlic to be noticeable, it was a bit harsh here. Darn! I wondered how the heck I could make a carbonara we’d love. Suddenly, I remembered my Pasta alla Pomegranate Vodka with Bacon. For that dish, I cook the bacon in the microwave to avoid a pan full of grease. Then, I skip the garlic and instead, sauté shallots in butter and olive oil. My Bucatini with Clams and White Wine includes shallots and the butter + olive oil combo too (although it has garlic as well.) 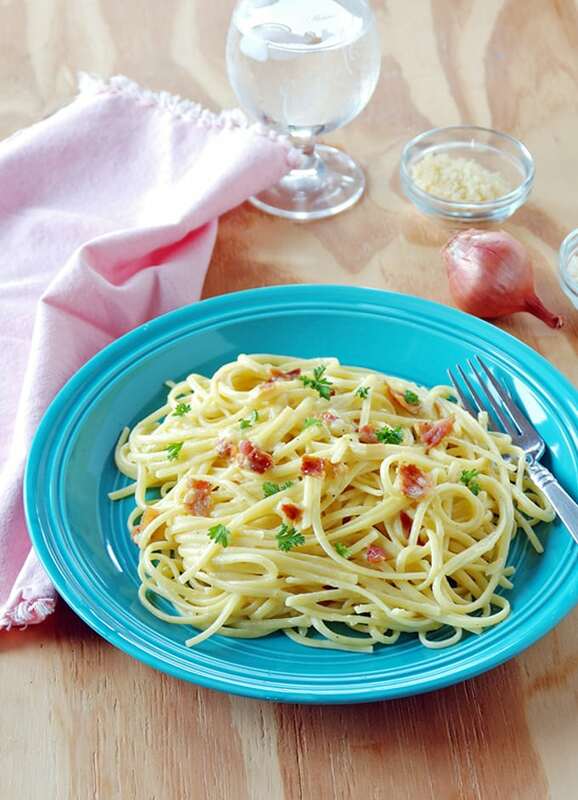 Surely, I could rely on shallots — with their fabulous flavor that’s almost a cross between onions and garlic, plus their ability to nearly melt into a pasta dish — to make my carbonara sing. So, I made pasta carbonara with shallots, and even the angels were singing. 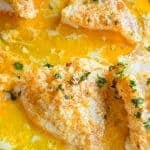 The dish has a velvety texture, thanks to the butter, nice bacon flavor without the grease, and a cheesy, shallot-ey goodness that makes you throw caution to the wind and grab seconds. It’s everything you’d want in Italian comfort food. Pair it with a salad or wilted spinach and garlic for a lovely, quick meal that tastes like a million bucks. Fill a large pasta pot just over half-way with hot water. Add in 2 teaspoons salt, cover the pot, and heat on high on your stove. Line a dinner plate with two paper towels. Place six strips of bacon on the paper towels and cover them with another paper towel. Microwave the bacon for 90 seconds, or until it is cooked through but not crispy. Dab the bacon with the top paper towel to absorb the grease and set the bacon aside to cool. 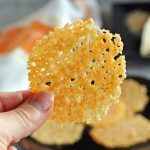 Grate your cheeses in a blender, if needed. In a small bowl, crack your eggs and beat them with a fork. Whisk in your black pepper, then your Parmesan and Romano. When the water on the stove is boiling, add your pasta, stir it in, and lower the heat to medium-high. Leave the pot uncovered and stir it occasionally to prevent sticking. After a few minutes, scoop out a couple ladles of pasta water into a bowl to use for later. Peel and chop your shallot. In a 10-inch skillet, add your butter and olive oil and heat the pan on medium-high to melt the butter. Add your shallots to the pan and lower the heat to medium. Stir the shallots to coat them with the butter and oil, then let them cook for a few minutes until they are soft. When they're done, turn off the heat and transfer the pan to a cool burner. Cut your bacon into small pieces using kitchen scissors or a knife. When the pasta seems like it needs another minute to be al dente, turn off the heat and drain the pasta in a colander in the sink. Then, return the pasta to your pot on the stove and stir in the shallot mixture (make sure to scrape in all the butter and olive oil from the pan), your egg mixture and the bacon. Turn the heat on low and continue stirring the pasta to allow the egg mixture to come to a safe temperature. When the egg mixture starts to thicken (after a couple minutes or so), turn off the heat. If serving immediately, you may not need to add any reserved pasta water, because the pasta should be creamy enough. But, if the pasta will sit for a few minutes, you will need to add some of the reserved pasta water to keep the pasta from drying out. The dish is best eaten right away, but if you have leftovers, add extra pasta water to them and store the pasta in the refrigerator for up to three days. Add a little butter or olive oil to the carbonara when reheating in the microwave. Shallots look like small, brown onions. When you peel one, you will usually find two purplish bulbs inside. Use both of them. 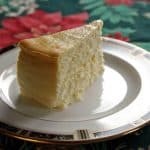 « Plan Your 4th of July Menu! Have tried many variations of this dish…and usually too heavy or greasy or I remember to change something up and I nail it just right. But, of course, I don’t write it down!! Yours looks pretty close, so I’m looking forward to trying it out this week ?….will let you know! 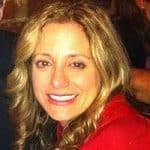 I hope you enjoy this, Joann! Looks great, gotta love a simple dish! Thanks, Angie! I love it when a dish is fast and delicious. This looks so tempting! I rarely indulge in pasta carbonara – oh the discipline! I do love the way you omit the bacon grease and use the shallot in place of garlic. Sounds delicious! The good news is, there’s no cream in carbonara, so I figure, a little egg, lean bacon and cheese can’t be so bad! Thanks, Tamara. Yes, yes, yes you can’t beat carbonara! Great idea to add shallots too. We get loads off of the allotment, don’t know why I haven’t added them to carbonara before! Oh my gosh, I’d be adding shallots to everything! 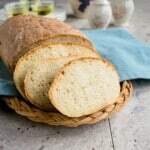 Creamy Carbanora without the bacon grease…I’m in! It looks so creamy and delicious! Yes! And we save some calories, right? Thanks, Kathi. That just looks so good! We never have pasta in the house — because, you know, we would EAT IT. I’m living vicariously through you right now! What?!! There are two things we freak out over potentially running out of — toilet paper and pasta! LOL! Thanks, Lisa. One of my favorite dishes. I, too, often substitute shallots. I like there sweet and garlic flavor they bring to a dish. I love shallots! Thanks, Peter.